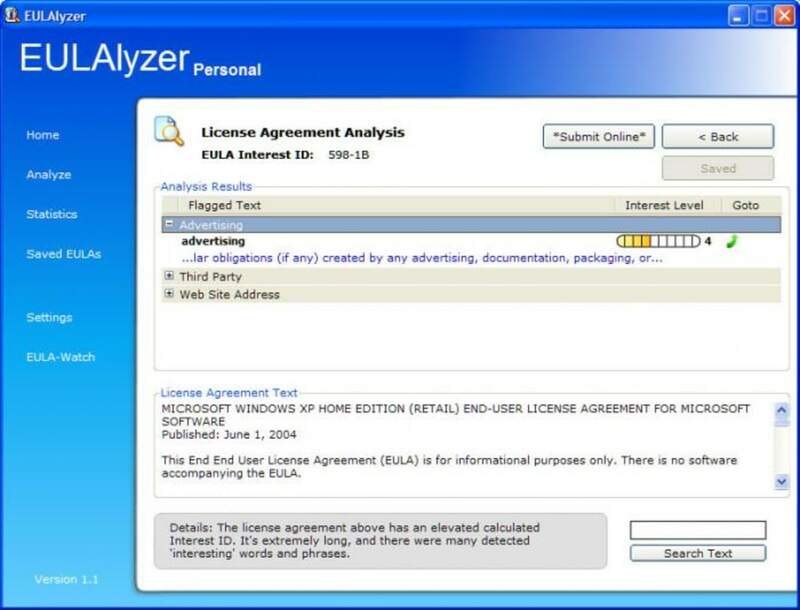 EULAyzer is a useful, free Windows software, being part of the category Security software with subcategory Encryption. Since we added this software to our catalog in 2007, it has managed to reach 960 installations, and last week it gained 1 download. About the download, EULAyzer is a light software that requires less storage space than the average program in the section Security software. It's a very popular software in Czech Republic. It's available for users with the operating system Windows 95 and prior versions, and it is only available in English. The program version is 1.2 and its last update was on 11/1/2007. EULAlyzer can analyze license agreements in seconds, and provide a detailed listing of potentially interesting words and phrases. Discover if the software you're about to install displays pop-up ads, transmits personally identifiable information, uses unique identifiers to track you, or much more. What do you think about EULAyzer? Do you recommend it? Why?